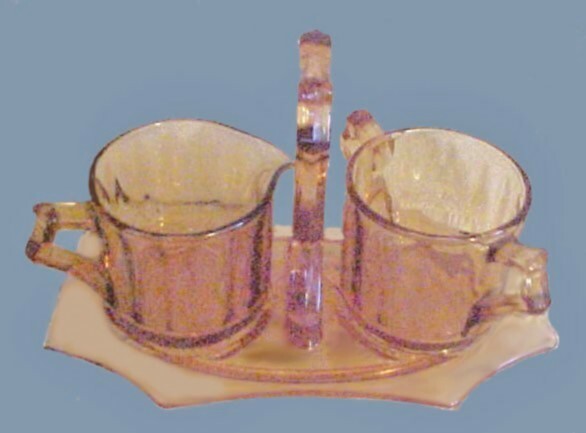 Cambridge Glass Co. produced these sets/tray in pressed clear glass. This set is marked as such. They were purchased by after-market-iridizers who created a number of color variations. There are literally dozens of these sets found in flashed-type marigold, having advertising to match the venue where they were sold. This, in many cases was a local State Fair. Again, one of the more affluent producers of clear, pressed glass, such as Heisey or Cambridge sold the rather plain design to after-market iridizers. The very size and absence of glass design, accommodated the lettering aspect. 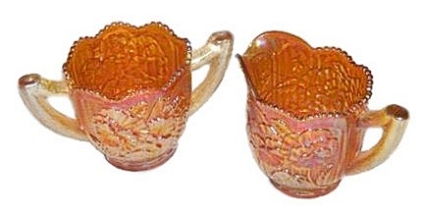 Items such as these were sold at Columbus, Ohio State Fair as late as the 1940s. 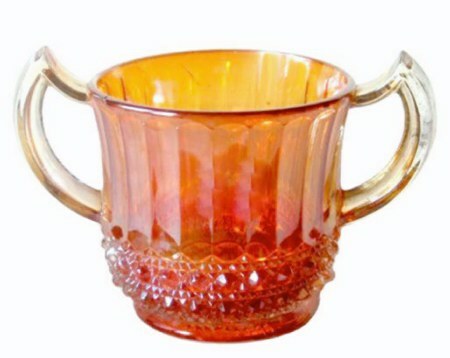 LUSTRE and CLEAR in Clambroth Breakfast Set by Imperial. 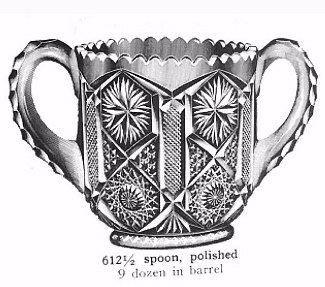 LUSTRE and CLEAR: This design is shown with 2 other breakfast sets in an old Imperial factory catalog. 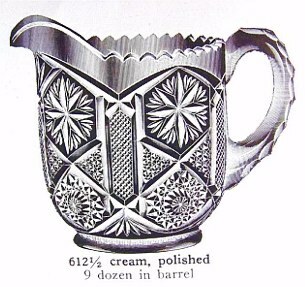 It is shown in the Archer book on Imperial, Ref: 1904-1938 Catalogs 104F, 101D, Bargain Book, Cat. 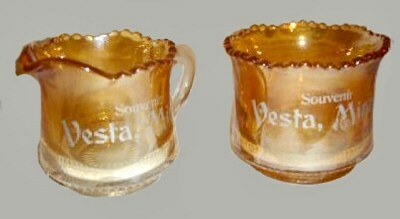 B. Lustre and Clear sets were designated #609 in the Imperial catalogs. Marigold and clambroth are the usual colors found. We have never heard of a set in purple. PANSY: Marigold, purple, helios, amber and aqua are known colors in these sets produced by Imperial. Purple examples are breathtakingly lovely and the aqua sets are on the pastel side. Very Scarce - 3.25 in. tall x 3.25 in. across. FLUTE and CANE: As with the other shapes in this obscure Imperial pattern, the breakfast sets are extremely difficult to find. Items within this pattern are reported only in marigold. GRAPE & CABLE in amethyst. GRAPE & CABLE: Somewhat smaller than the full size table set pieces, these have no thumbprint design around the base. Colors are limited to marigold, amethyst and green. Among the numerous shapes within this Northwood pattern, these breakfast sets can be considered quite scarce! STAR & FILE Creamer and Open Sugar. - 7 1/4 inches high. STAR and FILE: Apparently this was one of Imperial's very best sellers, for the list of shapes is extensive and ads displaying the pattern are numerous within the factory catalogs. It is their #612 and appears in their catalogs until late 1929. The pattern is almost exclusively found in marigold. At least 20 different shapes can be found within this pattern. Surely, in vain the net is spread in the sight of any bird; but they lie in wait for their own blood, they lurk secretly for their own lives.